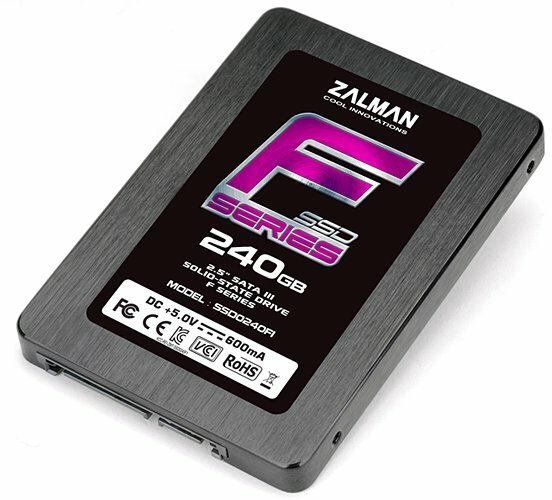 First graphics cards and now Zalman also enters the SSD market with the F1-series, a line of SandForce SF-2281 based disks with MLC NAND flash memory. The F1-series is available in three sizes, 60 GB, 120 GB, and 240 GB; priced at 11,980 JPY (US $153), 19,800 JPY ($254), and 39,980 JPY ($513), respectively. The drives take advantage of the SATA 6 Gb/s interface, and are built in the 2.5-inch form-factor. The drives offer read speeds of up to 560 MB/s, and up to 530 MB/s writes. The 60 GB and 120 GB models offer 4K random write performance of 30,000 IOPS, while the 240 GB one offers 45,000 IOPS.